Can the Supreme Court eliminate Inter Partes Review and destroy the patent killing machine that is, quite ironically, run by the same agency that gives them life? 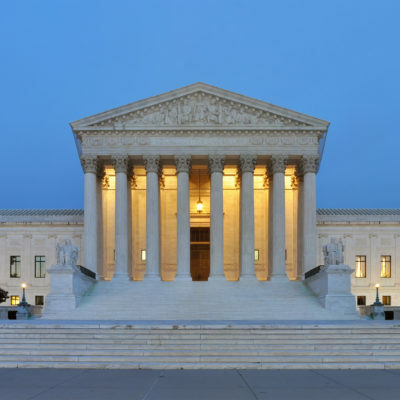 This week, the Supreme Court agreed to review, and potentially overturn, lower court decisions upholding the Inter Partes Review procedures of the America Invents Act, in a petition filed by Oil States Energy Services. The petition concludes, quite concisely, that “[t]he Constitution prohibits inter parties review.” The two grounds on which Oil States bases its argument include the Seventh Amendment’s guarantee of a jury trial, and the structure of Article III of the US Constitution. Although intertwined into a single issue presented to the high court, these are two separate and distinct arguments. Unfortunately, despite the relatively simple language of the Seventh Amendment, its application to the type of invalidity trials is far from certain. Whether the right to a jury trial is guaranteed in any given type of case is determined based on whether or not the case is one that would have been heard in English courts of law in 1791. Seriously. (Just take our word for it on this one because the explanation as to why this is the case would take far more than one blog post and honestly doesn’t make much sense anyway). Fortunately for Oil States, however, their argument is fairly succinct and straightforward. First, the Supreme Court has already held that patent cases “must be tried to a jury” in the landmark case of Markman v. Westview Instruments. Although something called a “writ scire facias” could have been filed in the old Chancery Courts, “even in those instances, any disputed facts were tried to a jury in the common law courts.” As a result, what essentially amounts to a trial over an affirmative defense to patent infringement must, according to the petitioner, be guaranteed an opportunity for a jury trial. Similarly, the Solicitor General, presenting the views of the US Government, also claim that the precedent established by Oil States is irrelevant because “Congress has since provided the statutory authority that was previously lacking.” In other words, the Seventh Amendment only applies if Congress decides it should. Obviously, it seems crazy that a constitutional amendment should operate that way, but there’s an even-money chance that it ultimately will. Even more important is that the private right exists wholly apart from the government once granted. See United States v. Am. Bell Tel. Co., 128 U.S. 315, 370 (1888) (“[The subject of the patent] has been taken from the people, from the public, and made the private property of the patentee * * * *”). That is why “[o]nce a patent is issued, the patentee must enforce the patent without aid of the USPTO.” General information concerning patents, USPTO, supra. If the patent were as tied to a public regulatory scheme as the PTO contends, the agency would also be responsible for violations of the patent. But that has never been the case. Two years ago, legal scholar Adam Mossoff explained that the Supreme Court’s opinion in Horne “confirms my own historical research that has revealed deep flaws in the current conventional wisdom that early courts did not protect patents as constitutional private property. … I applaud the Court for recognizing that intangible property such as patents deserve constitutional protection the same as any other type of property.” Now it seems the Supreme Court will have the chance to reaffirm that proposition. Ironically, the defense of the absurd regulatory scheme that is Inter Partes Review requires the government to now take a contrary position, asserting that patent rights are not property that stems from common law, while ignoring the substantial body of research proffered by the likes of Professor Mossoff and his contemporaries. With the stakes high and the arguments strong, court watchers will undoubtedly tune in next year to see what happens. If the current trend of reversing the Court of Appeals for the Federal Circuit continues, the Supreme Court will eliminate Inter Partes Review and destroy the patent killing machine that is, quite ironically, run by the same agency that gives them life.